RouteHappy is a new site that promises to make your flights more enjoyable. Summer travel's under way and with it comes higher prices, more crowds and an overwhelming number of choices and decisions when it comes to choosing the perfect vacation. With precious little time off to spend with family and friends, it's important to make the trip as pleasant as possible. Here are six sites, some new and some new-ish, that'll help make your dream of vacation ease a reality. Launched in April, RouteHappy is a flight search site that grounds itself on the notion that "all flights are not created equal." In other words, it doesn't make sense to shop for a flight -- often a big-ticket item -- based on price and flight schedule alone. 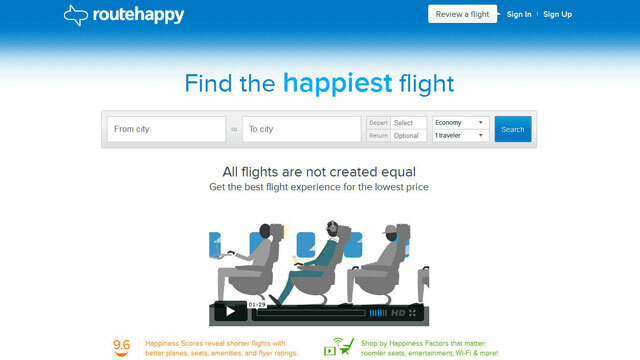 Routehappy's "happiness factor" ranks flights on a scale of 1-10 based on a variety of things like wi-fi, in-seat power, more leg room, seat-back entertainment and more. The "happiness factor" combined with the display of the price and schedule, theoretically allows fliers to get more for their money. In good news, my next flight (LGA - SAV in July) ranks a 7.8 of 10 on the "happiness" index. I'm not sure it's taking into account I'll be traveling with a 21-month-old past her bedtime. And how does that affect the happiness of the other people on my flight? The goal of any good traveler is to take direct flights whenever possible. Unfortunately, it's not always feasible, especially for travelers flying out of smaller airports. Smart Layover aims to "turn layovers into unforgettable adventures." If it can just make them bearable, we'll consider it a success. The just-released free app claims it offers day-use hotel rooms, exclusive sightseeing tours and activities in layover cities, and exclusive deals at airport terminals. Review to come. Launched in March and reviewed on ABC News soon after, the core of GetGoing is "Pick Two, Get One." So, if you're interested in going to say, the beach, and would be equally happy going to one of two destinations, you let GetGoing decide. The digital "roll of the dice" allows airlines to discount seats for people who may not otherwise take a trip, to the tune of a 20 percent to 40 percent savings for the traveler, according to the site's creator. Since our review, GetGoing has added a new feature: FlightFinder. This, the site claims, lets travelers easily search places across an entire region (e.g., Europe), or for destinations that match a particular experience (e.g., scuba diving) to find the most affordable destinations and convenient flight options. Travelers can book a flight to the destination they had in mind, or discover a less expensive alternative that provides a similar experience. It's a little more than a year old, but it's changing the way dog owners board their beloved pets when they vacation. Dogvacay's website pairs dogs with host homes while owners are away, saving both dog and owner from kennel boarding. Owners are sent daily photos of their pet. Dog owners can create an account on dogvacay.com, providing details about their pet, and then search listings for matching hosts in their area. Since its launch, DogVacay has grown to 11,000 host homes in the U.S. and Canada. Rates range between $15 and $35 per day on average. If you're a dog lover willing to open your home to other canines, you can make extra money by registering as a host for a dog whose family needs a sitter. Hosts post their own rates, and can distinguish the kinds of dogs they're looking to house and look after. We've written about HotelTonight a few times, but it's still worth mentioning, if for no other reason than it offers what we consider to be the easiest to use app for booking a last-minute (read: same day, afternoon) hotel room. Worth noting: In the case of a major weather event, like a hurricane, that cancels thousands of flights, you may not find what you need on HotelTonight because the hotels themselves may not have rooms to release. But it's worth a check, and HotelTonight is also a great option for an unexpected city stay, a road trip and other instances when planning ahead just isn't in the cards. Rooms, the company claims, are up to 70 percent off. Nothing can ruin a good old-fashioned family roadtrip like a traffic jam. The Waze navigation app has more than 30 million users and can simultaneously give you directions while monitoring traffic conditions as they're happening on the road. Waze was acquired by Google on June 11. All you have to do is drive with the app open, and Waze will gather all the information, such as traffic speed and detours. Users can even take a more active role and report traffic accidents and police checkpoints, and edit maps online. +Do You Have Poor Air Travel Etiquette?